Lavaca County Courthouse July Fourth 1899 Hallettsville Texas. 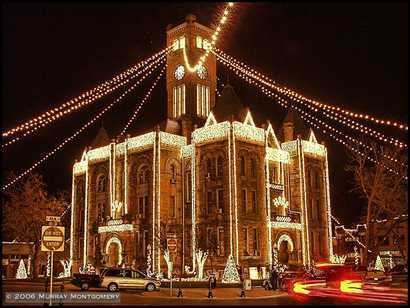 "The Grand Old Lady On The Square"
During the Christmas season, when it sparkles with decorative lights, you can see the old structure for miles; a shining beacon from the past and yet the splendid old courthouse is still serving the people of Lavaca County. For over 100 years the folks living in Hallettsville and the surrounding area have long been accustomed to seeing the dominant old building on the square. And it's hard to imagine how it must have looked when it was brand new, but when you think about it, the unique stone structure hasn't changed much at all. Thanks to an old newspaper from July of 1899, we can turn back the hands of time and get a glimpse of how the citizens of Lavaca County celebrated their brand new courthouse and from the information gathered; they had one heck of a party, with many people arriving in town on an "excursion train." The July 6, 1899, issue of the Hallettsville Herald described the event which coincided with the town's Fourth of July festivities. 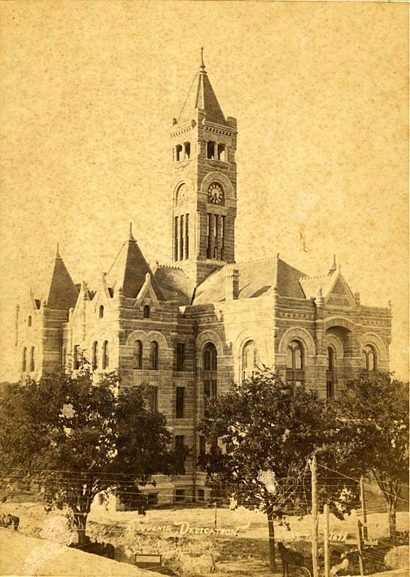 According to the aged article, the weather was beautiful and an estimated 5,000 people attended the dedication of what was billed as "the finest courthouse in South Texas." Evidently the plumbing of the building was very impressive and the newspaper paid tribute to Col. W.W. Otter, the Houston plumber who was responsible for the work. The Herald put it this way: "The many beautiful wash basins, the very artistic fittings, the convenient closets and lavatories, the pretty bath rooms with their artistic fittings and convenient equipments, large bath tubs, marble basins of the county's temple are a lasting monument to the biggest hearted man in Texas." There was a lot of music on that special day as bands came to town from all around the area to participate. Yoakum sent its Crackerjack Band and according to the paper, "The Yoakum boys were not expected and gave us a very agreeable surprise. The members are a jolly set, with J.N. Fagg as their leader, all those boys need is a nice lot of uniforms." The Meyersville Brass Band was part of the celebration and a man named Jutz was their leader. Golden Star Band of Appelt's Hill, lead by Joseph Appelt, was also there and were wearing their "pretty uniforms." Other bands came from Yorktown, Yoakum, Moravia, Meyersville, and Moulton to compete against one another. At the end of the contest, the judges declared the Yorktown Band as the winner and its members took home the grand prize of $25. According to the Herald: "The crowning event of the day was the grand ensemble selection, the 'Darktown Jubilee,' played by the seven bands at the close of the contest. An old soldier in the audience wiped tears from his eyes and said: 'That's enough for me. I am going home. I have never heard such music since the war closed.'" In addition to the band competition, fire departments from around the area also held a contest. Units from Cuero, Shiner , and Yoakum went against the Hallettsville Fire Department to see who could race around a block, connect to a hydrant, put on a nozzle, and get water. Cuero was the winner at 21 seconds and Shiner was a close second at 22. The paper reported, "Shiner was marked off a second and a half on a leak; otherwise they would have won." Yes, it must have been quite a celebration. According to the paper there was so much to be said about the courthouse and the celebration that it couldn't all be done in one issue. They summed it up this way: "It was grand, it was complete, it was perfect." The next time you take a look at the courthouse try to visualize that gorgeous day on the Fourth of July, 1899; 107 years ago when over 5,000 people gathered to celebrate their new courthouse - today we can still enjoy the beauty of that unique structure that I like to think of as "the grand old lady on the square."